Captain Veronica Ann Dare (service number 73998-38490-VD) is an intelligence officer in Section One of the Office of Naval Intelligence. During the Battle for Earth, she took command of Alpha-Nine, an Orbital Drop Shock Trooper team led by Gunnery Sergeant Edward Buck. 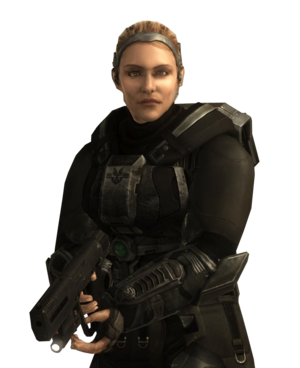 In 2558, she was married to Buck onboard the UNSC Infinity by the AI Roland. Veronica Dare was born on the human colony of Actium on December 4, 2515. Dare graduated from a Naval Academy, which led to her eventual posting with the Office of Naval Intelligence. At some point, she served as an intelligence officer on the UNSC Say My Name. Dare first met Edward Buck at Castellaneta, over Saturn. The two spent their week together, until Buck eventually realized that she worked for the Office of Naval Intelligence. Although the two parted on rough terms, at some point they reconciled and Buck even asked her to marry him, though Dare unfortunately remained silent, a decision that would continue to haunt Buck throughout all of his career. The two were eventually forced to split up due to Dare's job with Section One of ONI. In 2546, Dare ordered ODST squad Alpha-Nine, led by Buck, to retrieve important research data from a laboratory at Lethbridge's headquarters in the town of Belisk before the Covenant did. ONI intentionally kept the rest of the UNSC unaware of Alpha-Nine's mission. Dare believed that if the UNSC knew about the data, they would engage in standard operating procedure by encircling the lab and digging in. By doing so, the Covenant would become aware that the laboratory contained something valuable to the UNSC. Thus, another ODST squad was used to serve as a distraction, while Alpha-Nine recovered the data and returned to base. Following Alpha-Nine's successful recovery of the data, Dare reprimanded Buck for disobeying her direct order and threatened him with a charge of insubordination, but he did not receive any other apparent punishment. This was the last time Dare would see Buck for the next six years. On October 20, 2552, during the early stages of the Battle of Earth, a large element of the 65th Shock Troops Division was to be inserted onto the Solemn Penance, flagship of a small Covenant invasion fleet, stationed over New Mombasa. Dare, however, was under orders to perform a classified mission in the city and she needed a squad of ODSTs to assist her. Dare requested a particular ODST squad from an Admiral aboard the UNSC Say My Name to partake in her mission. The admiral was hesitant at first, but was forced to fulfill her request, seeing she was actually an ONI Section One operative, and thus did not report to the Fleet. At one point before the drop, Dare contacted the NMPD Headquarters, asking the communications duty officer there to go against Commissioner Kinsler's orders and turn the Superintendent back on. They soon started an argument, and after Dare threatened to fire the officer for insubordination, the enraged communications officer hung up on her. Moments before the ODSTs' drop, Dare took command of the squad led by Gunnery Sergeant Edward Buck, causing some confusion among the squad members, and told him that infiltrating the Solemn Penance was not their mission anymore. During the drop, she ordered the squad to change their drop pods' course at the last moment so they could perform her mission, just as the ship entered slipspace, damaging the city and releasing a large EMP wave which disabled the pods' electronic systems and scattered them throughout the city. Dare's pod landed in Tayari Plaza. However, she was unable to leave her pod due to the damage it had sustained during the drop. She then radioed Buck for help. Before Buck arrived to her location, Dare somehow got out of the pod before a Covenant Phantom arrived. When he arrived at the pod, he found it to be empty; he presumed her dead when he saw her helmet in the grasp of an Huragok. Thinking the creature would kill Buck, Romeo killed it and in the resulting explosion her helmet was launched through a window and into the viewscreen where the Rookie would later find it lodged. Six hours after the drop, Dare had made her way to sub-level 9 of the Superintendent's data center. Following her trail was the Rookie; Dare was surprised to see him as he arrived. With him, she made her way to the core, explaining to the Rookie that their original mission was to retrieve crucial information that the Superintendent had on a seismic anomaly prior to the Covenant invasion. The mission, however, would have been suicide to go alone, as Dare needed a team behind her. As there were only two ODSTs battling through Covenant forces, Dare was impressed with the Rookie, amazed he survived alone in the city. Dare and the Rookie meeting Quick in the data center. When they got to the data center's infrastructure, she discovered a Huragok called Quick to Adjust that she initially believed was trying to harm the Superintendent and its subroutine Vergil. Upon further investigation, she had realized Quick was actually trying to help the Superintendent by repairing it. Her investigation also led her to believe that the Huragok was assimilating the Superintendent's data in order to help the UNSC discover the Covenant's intentions for the city. With the data secure inside Quick, the Rookie and Dare began an attempt to evacuate to the surface. The trio rendezvoused with Buck, who had figured out where Dare was, just as the Jiralhanae started swarming the core. Once they reached an elevator, Dare punched him in the face for "abandoning the mission". Buck complained that she was missing and his squad was scattered, only for Dare to spontaneously kiss him for coming back; they both became embarrassed with the Rookie and Quick, looking on. Upon getting back to the surface, they discovered more Covenant ships coming out of Slipspace over New Mombasa. Dare was dismayed that Buck neglected to mention it; he snapped that he was too busy watching out for Quick; they argued to the point where Dare confessed that she'd thought she'd never see him again. Quick then grabbed their attention by getting into an Olifant, quickly repairing it and honking its horn for their attention. They made their way across the coastal highway to the Phantom the squad had stolen previously, allowing the squad and Quick to escape the city, as the Covenant began to glass it. As they flew away, Buck asked Dare if they can have a relationship again; she held his hand and told him, "Win this war...then ask me that again". Johnson and Dare arrive to interrogate Vergil. Shortly after their escape from New Mombasa, Dare had arranged for Quick to be quarantined in the Quito Terminus atop the Quito Space Tether for questioning, with Alpha-Nine acting as security for the creature—allotting some much-needed time for she and Buck to catch up. During she and the squad's growing rapport with the Huragok over the following weeks, Dare decided to name it "Vergil" after the subroutine it had absorbed. In this time, Dare and ONI had little success with breaking Vergil; though it was technically Dare's interrogation, Admiral Terrence Hood granted Sergeant Major Johnson clearance to interrogate Vergil regarding the Covenant's excavation in Kenya in the hopes he could get something out of him. On November 15, just prior to the interrogation, Dare had questioned Johnson on his recent return from Installation 05 in a Covenant vessel. Despite Dare insisting Johnson be gentle with their ally, he tossed Vergil his lighter, prompting Dare to warn that the creature was very flammable. Johnson cut straight to the chase, telling Vergil to answer his questions as to why the Covenant was digging; Dare had made sure her AI, Barca, was recording the interrogation. Dare had become confused or frustrated by several of Vergil's answers and ultimately, they were unable to obtain any actionable intelligence before the Prophet of Truth arrived in his Forerunner Dreadnought two days later. During the final weeks of the war, after Alpha-Nine had been redeployed elsewhere, Dare would occasionally update Buck on Vergil's status. In February of 2553, Dare and Buck traveled to Sundown for a week-long vacation together while on shore leave. Jun, a former SPARTAN-III and now recruiter for the brand new Spartan branch, interrupted their shore leave and offered Buck a chance to join the Spartans. After he declined, Dare spent the rest of their vacation trying to get him to change his mind. In 2554, the United Rebel Front attempted to take control of Draco III, which was finally being resettled for the first time in nearly two decades. She sent Buck to lead the mission to eliminate the rebels on the planet, as he was one of the few Draconians left. Later that year, Dare spent a week-long vacation on Desdoron V with Buck, who later departed to Mars where he underwent the necessary augmentations alongside Mickey and Romeo. During his last recovery round, she visited him and warned him that an unknown individual covertly loyal to the United Rebel Front had succeeded in becoming a SPARTAN-IV. During Alpha-Nine's tenure as Spartans, according to Buck, Dare would disappear for weeks on end running different ONI operations, though the two would meet up whenever they had mutual down time. In 2555, Dare informed Buck that Vergil and his handler, Sadie Endesha, now working for ONI, had been captured by the United Rebel Front on Talitsa and suggested that due to Alpha-Nine's history with the Huragok, they should be the ones to rescue them. Following Mickey's defection to the Front, and his subsequent capture by Buck and Romeo during the mission, Dare told Buck that he did the right thing by letting Mickey live. Three years later, Dare spoke with Buck following the official disbandment of Alpha-Nine as well as his reassignment to Fireteam Osiris, making him promise her to return alive. As of late October, 2558, Dare still works for ONI, though her official whereabouts are unknown. After Earth fell during the Created conflict, Dare was reunited with Buck aboard the UNSC Infinity with the mission to reform Alpha-Nine in order to convince the United Rebel Front on Cassidy III to reveal the secrets behind the Forerunner technology that cloaked them. To Buck's ire, this meant breaking Mickey out of prison at the Spartan-IV training station as they needed Mickey due to his credibility with the Front. During the operation, Buck and Dare discussed their relationship a few times, including the possibility of them getting married which they had both agreed was a bad idea in the past due to the dangers of their jobs but which Dare appeared to be reconsidering. On Cassidy III, Dare peacefully negotiated a deal with Mayor Wells of the Hole in the Wall, but the arrival of a Guardian changed things. When Buck nearly fell out of a Condor to his death, he admitted that he wished he had married Dare when he had the chance. Dare overrode Buck's orders to leave him behind and had Alpha-Nine rescue their leader. In the aftermath of the operation, Dare essentially dared Buck to marry her as she knew that he would never propose if she didn't do something and then began taking steps for an immediate wedding to Buck's surprise. The two were married by Roland in a bar onboard the Infinity mere moments after Dare proposed with both Fireteam Osiris and Alpha-Nine in attendance. Veronica Dare has held a high authority over the military operations she has been in. During the Battle of Mombasa, Dare has placed a higher priority on her covert assignment without explaining the reasons to her squad barring Buck. To the civilian populace prior to the battle, Dare was considered to be an unreasonable person who cares little about their plights. Buck's perception of Veronica is ambivalent with her evasiveness of answering personal questions. Despite having a seemingly cold personality, Veronica genuinely cares for Buck and regrets her line of work interfering with their relationship. Dare and Buck reconcile towards the end of their operation, making attempts to meet each other whenever taking shore leave from their respective assignments. Dare has a tell where sometimes when she's lying, she touches the fingers of right hand to her lips. Buck is aware of this tell but has never shared it with anyone for reasons both good and bad. Buck doesn't believe anyone else knows about Dare's tell. Dare developed a romantic relationship with Edward Buck, a veteran Orbital Drop Shock Trooper. At one point, Buck proposed to her, but Dare remained silent, feeling that her job would force them to split. The two eventually agreed to end their relationship. The two first met on Castellaneta, a resort orbiting Saturn. Although the two enjoyed their week of shore leave together, Dare left him after Buck realized that she was a "spook". After their encounter on Sargasso, the two avoided each other for the remainder of the war, until they were forced to work together in the Battle of Mombasa. Although he thought he had buried his feelings for her, Buck's search for her during the battle made him realized that he had not gotten over her. After their time together on Mombasa reignited a spark in their relationship, the two vacationed together on Sundown. Despite being a high-ranking ONI agent, Dare had reservations about Jameson Locke when Buck was assigned to Fireteam Osiris, warning him that Locke is "ONI to the bone." She also expressed genuine concern that the nature of Fireteam Osiris would possibly get Buck killed, making him promise to stay alive for her sake. In late 2558, after reuniting Alpha-Nine to negotiate with the United Rebel Front on Cassidy III, the two discussed their relationship and the possibility of getting married. Though Buck had proposed in the past at least a couple of times, both had agreed that it was a bad idea with their jobs and the dangers that came with them. When Buck thought he was going to fall to his death, he admitted regret for not marrying Dare when he had the chance before being saved by his teammates when Dare overrode Buck's orders to leave him behind. After returning to the UNSC Infinity, Dare proposed to Buck in the form of a dare when she realized that he would never propose first. They were subsequently married by Roland in a bar on the Infinity moments after Dare proposed, witnessed by both Fireteam Osiris and Alpha-Nine. Check out our collection of quotes related to Veronica Dare in its quotes page. Veronica Dare is voiced by Tricia Helfer, who is widely known for her portrayal of "Number Six" from Battlestar Galactica. Helfer's likeness was also used to model Dare. She joins Katee Sackhoff as another Battlestar cast member lending their voice to the Halo games. Dare is unlocked for play in Firefight by beating the Campaign on Legendary. Dare is the first playable female character in the Halo series, not including the Spartans in multiplayer. Dare's Recon helmet is unlocked for Xbox Avatars by getting the Vidmaster Challenge: Endure Achievement. A render of Dare in full gear. Dare's face, through the low-polarized visor. Dare and Buck on UNSC Say My Name. Dare pointing at Truth's fleet as the ships arrive over Mombasa. ↑ Halo Waypoint - Is there an actual name for Vergil?